Food : All types of fish food but prefer live and frozen blood worm, Mosquito and insects. Care Level : Planted tank is preferable. 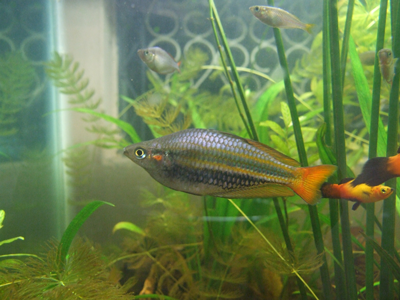 Female: Plain fins / less color with round edge. Egg Layers : Yes, Clear Round big eggs, will hang in plants and visible. Breeding : Very Easy if you have plants and a pair of fish male and female. Tips : Feeding live food will make them to lay more eggs when compared to flakes. Once started breeding they will continue to lay eggs daily.